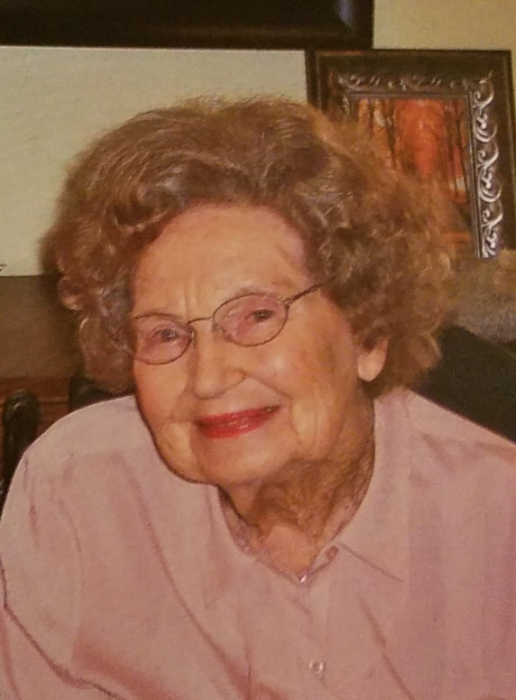 Nita Proffitt Wells died Monday, February 11, 2019, in Graham, Texas. Funeral services will be Friday, February 15, 2019 at 2:00 p.m. in Morrison Funeral Home Chapel. Burial will follow in Proffitt Cemetery in Young County under the direction of Morrison Funeral Home. Nita Proffitt Wells was born February 21, 1926, to Cora Wiley Proffitt and Drenin Reuel Proffitt in Petrolia, Texas, in Clay County. She moved to Newcastle, Texas, when she was two years old. She graduated from Newcastle High School in 1942 and married Robert T. Wells, Jr. February 11, 1945, in Fort Worth, Texas. She lived in the Proffitt community for more than sixty five years, where she and T were members of Proffitt First Baptist Church. The last years of her life she lived in Graham, Texas. At the age of sixteen she began working at Farmers’ National Bank, where she worked more than thirty five years. After retiring from the bank, she sold real estate for a few years. Nita was a leader in her community. She was an active member and on the board of the Young County Historical Commission for many years. She volunteered for activities at Fort Belknap and served on the board of the Proffitt Cemetery, which was named after her family. She was preceded in death by her parents, her husband of sixty eight years Robert T. Wells Jr., her sisters, Helen Proffitt Patton Bessire (born April 11, 1919) and Wanda Proffitt Nixon Ford (born in Petrolia, Texas, Clay County, October 7, 1924), nephew Arthur Eugene Nixon, Jr., nephew Martin French, niece Julia French Bayles, and sister -in-law Betty French. Nita is survived by nieces and nephews Barbara Ford Proffitt-Arnold, David Michael Patton and wife Cathy, Joan Patton Scales and husband John, Elizabeth French Finn and husband Jack, Jeff French, and a host of great and great-great nieces and nephews. Gratitude is expressed to Ruby Quinn and Daniel and Trachelle Lewelling, for their loving care.